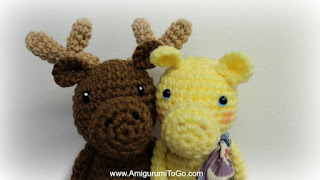 I have the wee moose video uploading to youtube right now and the written pattern will be released along with the video. I know some of you are waiting on the bigger moose and a couple others but I need to get myself back into the groove of things with these smaller animals first. It's been so long since I've been filming it's taking time to adjust. There's so much that goes into putting a video together, not just time but energy. The smaller videos like the moose and the koala have been a challenge so I'm definitely doing the right thing by coming back on youtube with these. I was happy with the koala video but I'm happier with the moose video. It's little things that make the difference! And soon I'll be back full force with longer vids. Next up the Wee Moose. And he has a girlfriend! May I ask you (as I am a beginner) if I follow your instructions but using a bigger yarn & crochet, will the result be Ok ? I will read it right now. Thank you for putting so much energy into sharing your skills with us. And please, don't hurry yourself so much! It's us who have to learn to be patient, not you who has to learn to hurry up. I appreciate that so so much! 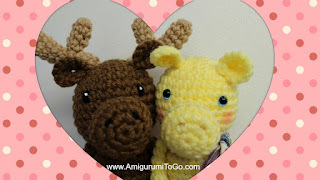 Hi Sharon, I am so excited every time I read your new post and want to try all the pattern. Many thanks for your sharing! BTW, I would like to ask you that if you have any pattern of Cony and Brown (Line). As my best friend is going to get married and I would like to make the Cony with wedding gowns and Brown with suits as her wedding gift. I actually never heard of them so had to google. They are so cute! I don't know of any patterns out there and my to do list is really long. But maybe one day!